I could do a better job keeping current on LinkedIn. But I don’t. A couple times a month I make an appearance and poke around a little. Before logging out, I usually think to myself that I should spend more time here — it’s a good place to talk shop and most of the time I run across something worth reading. A few days ago, an Inc. article someone shared caught my eye and stirred up that thought again (https://goo.gl/YfZS2M). 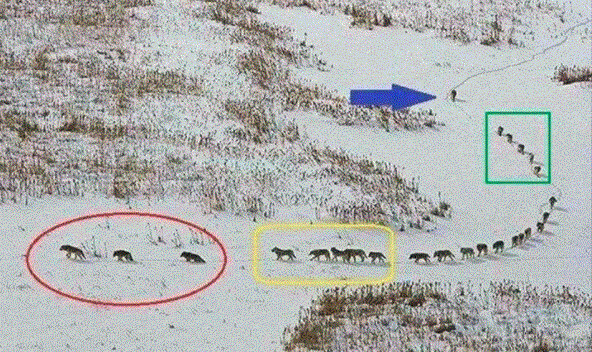 The author’s focus is a FB post about the leadership lessons of wolves which went viral. Maybe you’ve seen it. The picture was just offbeat enough to stand out and get me to read the title. And the title, “Leadership Perfectly Defined in 1 Inspiring Photo (From a Most Unlikely Source)” was a good enough application of headline gimmicks to draw me in. Part of what interested me was the promise of a perfect definition of Leadership. I wanted to see how the author was going to come through on the impossible. But more than that, what I really wanted to know was who was behind the post. Who is Robin Gill Wind and what makes her posts go viral? Well I should make a correction right away. It’s not posts in the plural but post in the singular. With less than a thousand friends on Facebook and in the midst of fairly average activity about her family and career, on June 10 this leadership consultant from Royal Oak, Michigan, added a photo to her page about wolves which resulted in 40K reactions, 23,786 shares, and 2,609 comments. The fact that this post is such an outlier on her page made it even more interesting to me. Why the difference? The basic point of the post is that the alpha isn’t out front but taking up the rear. The leader ensures that no one is left behind. He keeps the pack unified and on the same path. He is always ready to run in any direction to protect & serves as the ‘bodyguard’ to the entire group. Just in case anyone wanted to know what it really means to be a leader. It’s not about being out front. It means taking care of the team. A pretty good illustration of a pretty important leadership principle, I thought to myself. Leadership means “taking care of the team.” Okay. But that’s nothing new. So what’s with all the buzz? 2,609 comments. That’s a lot! But I was hooked. So I started to read through them in search of a clue. It didn’t take long to come across someone complaining that the explanation of the picture is made up. And then another. And then another. And sure enough it is. Evidently wolves don’t behave like this — no matter what we want people to think about leadership. So what’s up with going viral? And how in the world did it end up on Inc? Welcome to the death of the Age of Reason. There is no right or wrong. Not anymore. There’s only being in and then being out. There are probably good scientific reasons to explain how this post went viral despite the facts. But in a time when currency is counted by clicks maybe Frank Underwood has it right — its mostly about “being in” and “being out.” Welcome to the Dawning of the Age of Groupthink. Check out Frank Underwood in action. I didn’t actually figure out what made Robin Gill Wind’s post about wolves leading from behind go viral. Unfortunately, my analysis was called short by the final episode of House of Cards. Nevertheless, there are clearly popularity thresholds implicit in social media which increase by stages the risk to the masses of “being out” and the motivation to behave in ways which favor “being in” — even when “being in” favors mind numbing conformity. In another time, we might have asked ourselves if “being in” actually suits us. But those times are long gone. And the question surfacing now in my mind is how far will we go to keep pace with the pack? In our fear of being excluded, are we really willing to forfeit what makes us worth being included in the first place — our creativity, unique purpose, and independent thinking?